Are you tired of walking into a shoe department and searching for someone to help you? This won’t be the case at Comfort Wide Shoes & Orthotics. We feature SAS (San Antonio Shoes) and other leading brands. 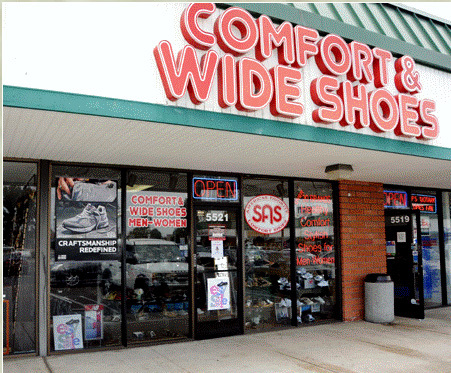 We are a traditional “sit-and-fit” shoe store that provides customer service second to none. We carefully measure and assess your feet and assist you in trying on the shoes you have selected. We carry a large variety of wide and extra wide footwear for men and women in hard to find sizes; up to 14 E in women’s and men’s shoes. To ensure a proper fit our staff are trained Proffesional Shoe Fitters dedicated to achieving maximum comfort and support for you personally. Our trained Pedorthist will help you with any Orthotic needs you may have. This good old fashioned caring service is why we are still in business these past 33 years in the same location. To you new customers, welcome to Comfort Wide Shoes. To all our existing customers thank you for your continued support, Jerry Ewell, Pedorthist CWS.